'Awkward' And 'Insecure' Get To The Root Of Writer Issa Rae's Humor As a self-described "awkward black girl," Rae says she often felt that she was straddling two worlds growing up. She drew on her own experiences to create the HBO series Insecure. "This character is in between two worlds and is just in a constant state of discomfort," Issa Rae says of Issa Dee, her character on HBO's Insecure. Writer and actress Issa Rae is upfront about the fact that she doesn't always fit in. She tells Fresh Air's Terry Gross that she was so socially uncomfortable and introverted growing up that one day she wrote the phrase "I'm awkward. And black" in her journal, and it was a revelatory moment. "I knew I was black, obviously, but the 'awkward' part really just defined me in a sense," Rae says. "That felt like an identity that I had not seen reflected in television or film before, or at least in a very long time." In 2011, Rae brought that sensibility to her Web comedy series The Misadventures of Awkward Black Girl, which ran for two seasons. Now, Rae continues to explore themes of race, identity and belonging as the creator and star of the new HBO series Insecure. 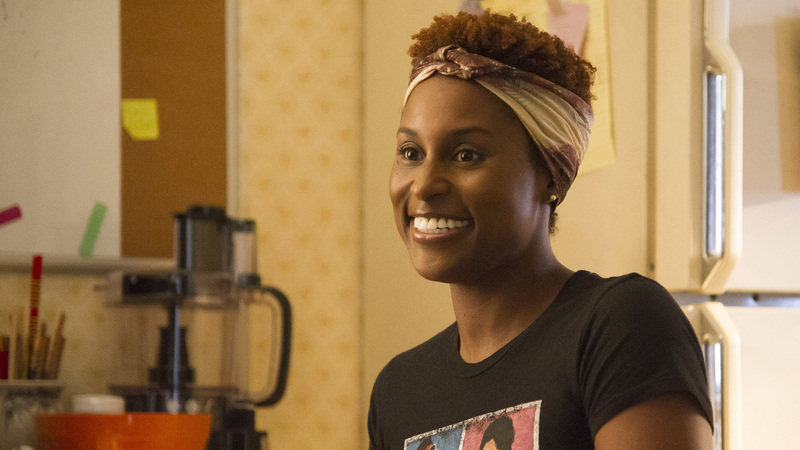 Rae's Insecure character is a 29-year-old woman, also named Issa, whose life seems to have stalled. Her relationship with her longtime boyfriend is out of sync, and she's frustrated in her job at a nonprofit organization, where she feels like the token black person. "We wanted to paint that this character is in between two worlds and is just in a constant state of discomfort," Rae says. She's "not black enough for the black people and not white enough for the white people." I think the bathroom is definitely her safe space, and the space where she can actually be vulnerable and express herself in an extremely honest way. It's the only place that she is actually honest with herself and expresses her thoughts in a way that she can't in the outside world, because she's a self-described "aggressively passive" person. So you'll see a lot of those mirror moments where she's kind of forced to face her truth and herself at the end of the day. It came from watching shows like Seinfeld and Curb Your Enthusiasm and even 30 Rock and just identifying with a very specific sense of humor that those shows had, but also being like, Wow, There are no people of color in these shows that have the same sense of humor, and wondering, Why is there this segregated humor? There seems to be, like, "black humor" and there seems to be "white humor," and a lot of my friends' taste we like both, but we don't get to see ourselves reflected on the "white humor" side. There seems to be, like, "black humor" and there seems to be "white humor." And a lot of my friends' tastes — we like both, but we don't get to see ourselves reflected on the "white humor" side. I wanted to take these traits in the same way that a lot of my favorite comedians have done, Ellen [DeGeneres] included. Ellen takes so many relatable, embarrassing moments and amplifies them. And ... [I wanted to] have a black character go through those things and make it very racially specific, but universal at the same time. I won a copy of the script for that episode and it ... is tattered, because I would always use that as a template to write scripts. So when I wrote my Cosby spec script, when I wrote my original spec script, it was always based on that format. ... For me it just felt doable, it was like, Oh my gosh, I have the key, I have the secret of how it's done and the formula is at my fingertips. My dad, just being African, was like, "Deal with it. Stop crying." My mom, she tried to get it, but her thing was always about embracing it [and] nobody wants to hear that. I think being a teen and being a preteen is all about fitting in and not standing out and everything she told me to do would cause me to stand out. "Embrace your hair!" "If they're talking about the way that you're talking, just say, 'I'm smart, that's why!' or 'I'm speaking English correctly.' "
It's like, "Mom, no. I'm not trying to feel superior. I just want people to like me." I have two older brothers and they were super into hip-hop [and] rap, and they would try to introduce me to artists, but I was more into R&B and just pop music in general. I was young. My mom shielded me, specifically, and my younger siblings from, like, explicit lyrics and explicit music in general. So they could introduce me, but I didn't really pay attention. So by the time I moved to LA ... I was really well-versed in R&B — nobody could touch me there — but I wasn't as into rap as a lot of the other students. I remember the year that I started sixth grade ... Tupac died and I didn't know much about him and obviously Tupac and LA go hand-in-hand, to a degree. ... I didn't know him. So when everyone was devastated that he died, I wanted to be a part of the conversation and had only read his name and hadn't heard it, so I came up to a bunch of classmates who already didn't like me ... and was like, "Oh my God, I heard that Tew-pack died? What did he sing?" And was just shunned for the rest of the quarter. I was actively producing another Web series about ... my brother's music group trying to make it in LA, and it was the first time that I had started to take Web producing seriously. ... And I realized, Man, it's just not doing the numbers that I want. I feel like they're so talented and it's really good. What is the issue? Our second season of Awkward Black Girl was produced by Pharrell Williams, via his I Am Other company, and that got press and we got reviewed in The New York Times for our second season opening. And that got the attention of ABC and [Shonda Rhimes' production company] ShondaLand, and I got an opportunity to develop a pilot with them, a completely different pilot called I Hate L.A. Dudes. And ABC ended up passing on that project and I was devastated. I was like, Man, I blew my one shot. And then HBO called me and said, "Hey, we heard that you're free. ... Do you have any ideas to pitch for us?" I pitched them the idea that ultimately became Insecure.